The most ‘hands-on’ research I did to explore Helen’s world was participating in the Nemean Games, and you can read about it in the ANEW magazine article. 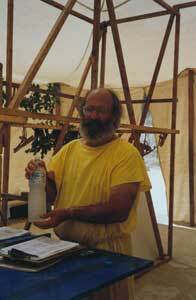 In July 2004, just two weeks before the Olympic Games in Athens, at the second full moon after the solstice, as in ancient times, I ran in a footrace sponsored by the Society for the Revival of the Nemean Games. 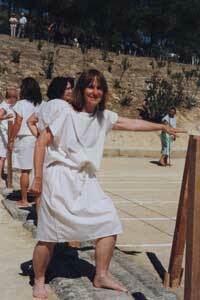 In this international event, we raced barefoot and in tunics in the original ancient stadium in Nemea, not far from Helen’s home. In Helen’s day, although women did not race with men, in Olympia there was a traditional race for sixteen women in honor of Hera. Since Helen was reputedly athletic, she may have run in such a race. In any case, going to Nemea gave me a chance to walk—or rather, run—in Helen’s historic footsteps. Everyone connects ancient Greece with athletics, depicted in the red-on-black of vases, or in gleaming white marble. We instantly think of the runners, wrestlers, and jumpers in the stadiums, and of winner’s wreaths. In Athens the recent Olympic winners were crowned with the historic Athenian olive wreath, keeping the tradition alive. 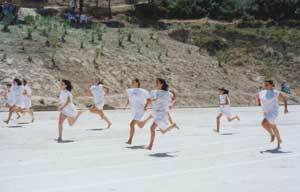 Although the Greeks invented the athletic contest, there are big differences between their competitions and ours. First of all, their games honored specific gods, and were held at religious sanctuaries. There were four main ‘crown’ games—games in which the winner received a leafy crown, and the type of leaves were specific to the god being honored. In Olympia, sacred to Zeus, the winner received an olive crown, at Nemea, also sacred to Zeus, a wild celery crown, at Delphi, Apollo’s site, a laurel crown, and at Isthmia, sacred to Poseidon, one of pine. The big goal was to be a winner at all four games, and collect four crowns. People had the crowns depicted on their tombstones, it often being the highest honor of their lives. Winners of the contests were lauded in their hometowns and given a statue and free meals for the rest of their lives. In addition, time was measured by the contests. A year would be identified as “the third year of the Olympiad in which so-and-so was the winner.” No shoe endorsements (as they competed barefoot), no TV deals, but a nice sort of immortality. The premier event at these games was the one that is still the big one today: the stadion sprint. (Even now the press loves bestowing the label, “The fastest man in the world.”) But the biggest difference between their champion sprinters and ours is that there was no comparison between the different performances. The length of the stadiums was not standardized, so the races were over different distances, and most important, they could not be timed. There was no way of establishing and comparing records. You could race against only the people in that particular race, not against any others. So it was impossible for anyone to know, for sure, that he was ‘the fastest man in Greece.’ This gave an immediacy and importance to each contest, because each was free-standing. Although the modern Olympics purports to resurrect the ancient ideal of pure competition, in today’s world, with its enormous population, it has had the opposite effect: With the huge pool of potential athletes to draw from, the ones selected for the final competition are not mortals at all, but train and live in a manner completely impossible for most, shall we say—normal?—people. Athletics has become more and more a rarefied world for supermen and women, and beyond the reach of ordinary people—this at a time when health experts decry our increasing lack of fitness. In our society, children play on the playground, but then get herded into organized team sports quite early—team sports that they will not be able to continue as adults, leaving them without any athletic endeavors past the age of eighteen. In 1996, a group of Greeks living in the vicinity of the ancient Nemean sanctuary, and the classics department of the University of California at Berkeley, which was excavating the site, hit upon the idea of reviving the ancient Nemean Games. They had the original stadium, and they had uncovered the remains of an ancient locker room, as well as the athletes’ tunnel leading to the stadium. To truly travel back in time and experience what it was to be an ancient Greek athlete, they organized races in which the contestants would take the athletes’ oath, line up on the ancient starting line with the starting-gate device the Greeks had used to ensure no false starts, run barefoot in tunics, win the wild celery crown and the victory palm. This contest would be open to everyone, men and women, not special athletes, and of all ages. 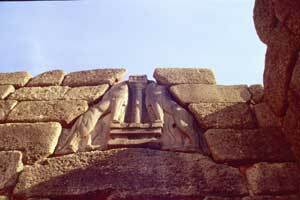 They called themselves the Society for the Revival of the Ancient Nemean Games. The 1996 games were such a success that they were repeated in 2000, 2004 and 2008. 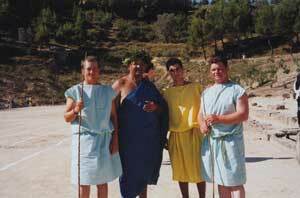 In 2004, the same year as the Athens Olympics, they had more than 900 contestants from over 30 countries.I had the privilege and excitement of participating in the 2004 Nemean Games. In ancient Greece, women did not participate in the contests. 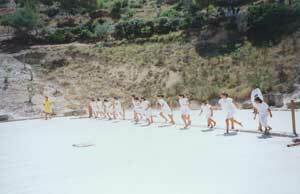 But in Olympia, they had their own event, the Maidens’ Race in honor of Hera, in which sixteen girls ran. In my novel, I had Helen run in a similar race before her marriage. I described the feelings and the experience of it, but wished I could do it myself to see if I had got it right. Imagine my delight to learn that I could! The Nemean Games beckoned—and I went. You can read about it in the ANEW magazine article. As a child I had been a fast runner on the playground, but honestly, what adult runs flat-out, except to catch a bus? Like so many women at the time I grew up, when we reached adolescence sports were out of our lives. (Note to women now: thank Title Nine for changing all that!) So I had a residual memory of myself as a fast runner, but had nothing at all to base it on. July 31, 2004, was hot—very hot, probably in the mid-to-high 90’s. I was lucky that my race was held before it got too beastly. The 87-meter stadium had twelve lanes and they took twelve runners at a time, starting with the oldest and working down to the youngest. For the women, the oldest was 79; for the men, the legendary LeGrand Nielsen, at 97. 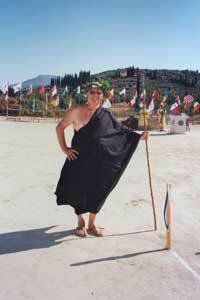 (He had also competed in the 1996 and 2000 Nemean Games and planned to return in 2008 when he was 101.) The youngest boy was 4 and the youngest girl was 6. Some noted contestants were Supreme Court Justice Anthony Kennedy and the famed long-distance runner Kipchobe Keino of Kenya. The tunnel is 120 feet long and in it the transformation takes place—you enter as a modern and emerge into another time. You step out into the stadium as the blue-robed keryx calls your name. You then go to the stone starting line, where your lane will be decided by lots cast in a bronze helmet. The elaborate starting gate apparatus, the hysplex, is intimidating; you wonder how you will keep from tripping on the ropes and falling flat on your face. We had been given instructions for toughening our feet to run on the hard-packed clay of the stadium. But honestly, I did not feel a thing as I ran it, although I had not done anything special to prepare my feet. The white-robed starter, the aphetes, gives three commands: “Poda para poda”—foot by foot, our “ready!”; “ettime”—ready, our “set”; and “apite”—“go!” as he releases the starting mechanism. After it fell and I jumped over the fallen ropes, I was out in front but was sure someone would catch up to me any instant. But I knew enough not to turn my head and slow down, so I kept going, and was astounded and unbelieving as I crossed the finish line first. Being crowned the winner was just about the most exciting thing I can recall, and impossible to imagine in the abstract. The philosophy of the Games, that modern people have to do them in order to understand them, was right. And most amazing of all, when I re-read my depiction of Helen’s race, I had described it almost perfectly, as if I had somehow known how it would feel. 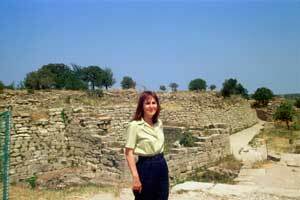 Helen lived—if she lived at all—around 1200 BC, in an era we call the Mycenaean age of Greece. 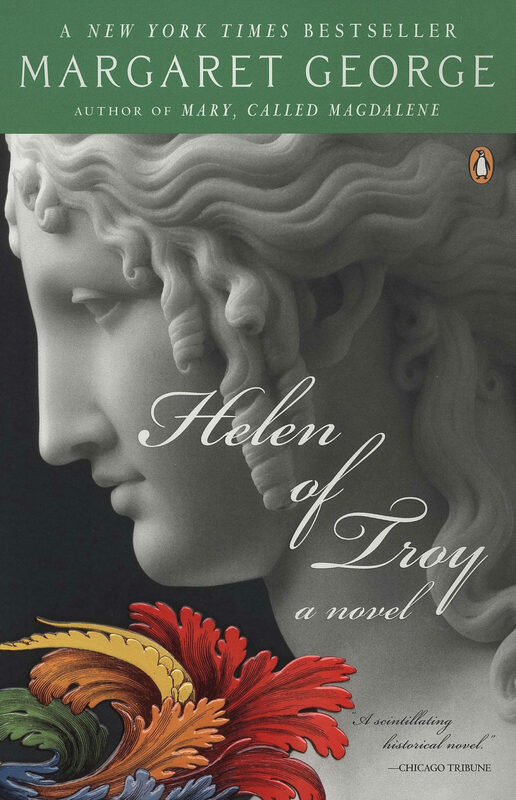 Helen actually came from Sparta, not Troy, but she became forever “Helen of Troy” when she eloped with the Trojan prince Paris, launching a thousand ships, (and today, a thousand hair-care products named after her). 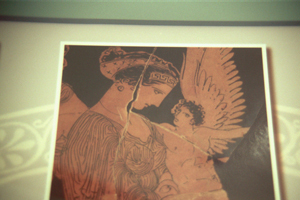 I’d like to share some photographs I took while following Helen’s life in both Greece and Troy. When Helen– the offspring of Leda, Queen of Sparta, and her tryst with Zeus in the form of a swan—was only a child, a Sibyl at Delphi foretold that she would cause a great war, and because of her many Greeks would die. 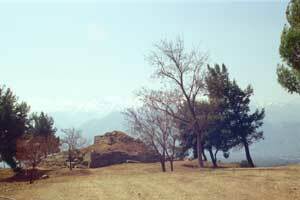 The crone’s rock is still there, near the temple of Apollo where the oracle would later sit. Rock where the Sibyl gave her terrifying prediction about Helen causing a war. What did Helen look like? Today’s movies and paintings make her a blonde, but ancient Greek paintings show her as a brunette. 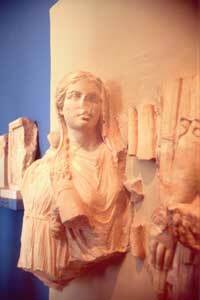 Homer merely tells us she was “white-armed, long robed, and richly tressed,” leaving the rest up to our imagination. Ancient artist’s rendering of Helen, with Eros urging her on. Helen had twin brothers, Castor and Polydeuces, and a sister, Clytemnestra. Clytemnestra later grew up to be the classic avenging, murderous wife, stabbing her husband Agamemnon in his bathtub when he returned from the Trojan War. In ancient times, different ruling houses had their own patron gods and goddesses. In the novel, Demeter and her daughter Persephone are the protectors of Helen’s household. 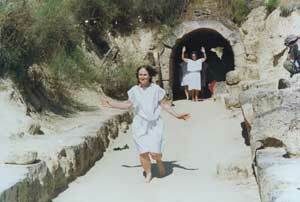 In one episode, Helen is shown attending the mystery rites of the goddesses. 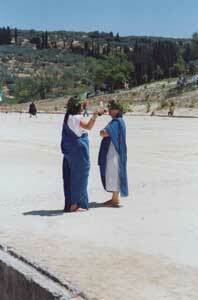 These rites began in Mycenaean times and lasted in some form until recently. The beautiful goddess Persephone, who spent only half the year on the earth, and the other half in Hades. Until recently, women danced with such torches in the fields of Eleusis to honor the goddess; this carving dates back to ancient times. 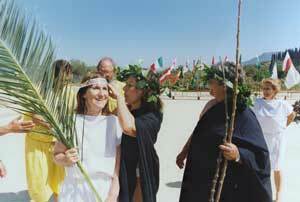 Mystery rites were held marking her daughter Persephone’s departure and return. 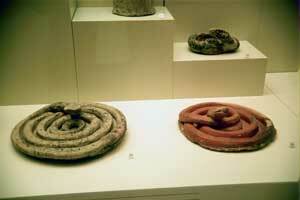 Snakes were also considered sacred, and many households kept a sacred snake. It was thought that if a snake at a sanctuary licked your ear you would receive the gift of prophecy. When Helen lived in Sparta, it was not ‘Spartan’ as we know the term. The military Sparta did not arise until some six hundred years after her time. In Helen’s day, it was a place of sophisticated music, poetry, and dining. The valley wherein it lay was very fertile, watered by the Eurotas River, and it was surrounded with the rugged Taygetus range of mountains; it was a beautiful, lush place with dramatic scenary. 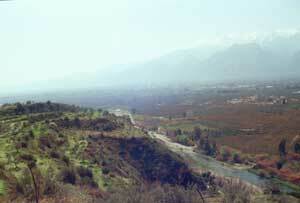 The place where Helen’s palace stood, high above the city of Sparta. The crown of Sparta passed through the woman, and so in choosing a husband Helen was also choosing the future king of Sparta. After the customary suitors’ contest, where more than 40 men competed for her hand, she chose Menelaus of the house of Atreus in Mycenae, the younger brother of Clytemnestra’s husband Agamemnon. 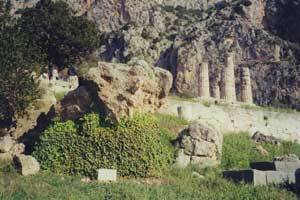 When Menelaus died, long after the Trojan War which he survived, he was buried in a stone mausoleum high above the river Eurotas. One legend says that Helen was also buried there beside him, and that a visit to her tomb had the power to bestow beauty on supplicants. Certainly the site today is powerful and evocative. Sign marking the entrance to the mausoleum site. The lovely setting of the mausoleum. The snowy peaks of Taygetus range in the background. The Eurotas River far below; the funeral cars had to pass through it. Helen and Menelaus lived peacefully for ten years, and had a daughter, Hermione. But when Paris, a Trojan prince, came to Sparta on a diplomatic mission, he and Helen became inflamed with love and ran away together. 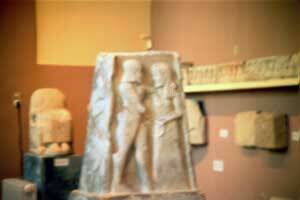 Paris was very handsome and allied with Aphrodite, the powerful goddess of love. 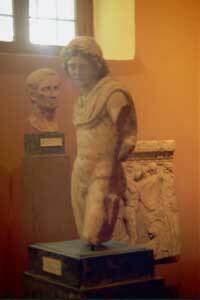 Statue of Paris, in the Sparta Museum. Sparta is some thirty miles from the sea; the first night Paris and Helen only got as far as a small island just off the coast, called Cranae. 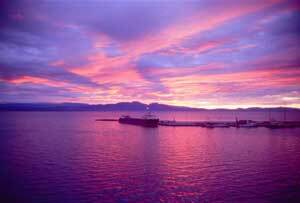 The photo, taken there, shows the spectacular sunsets they could have seen. 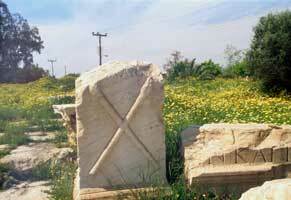 The Mycenaean world that Helen left behind has also left us many relics. 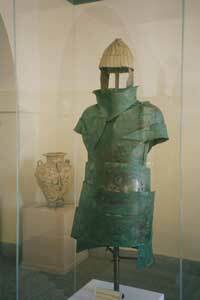 This heavy type of bronze armor became outmoded in the Trojan war. 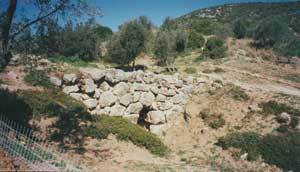 Mycenaean bridge of uneven boulders. 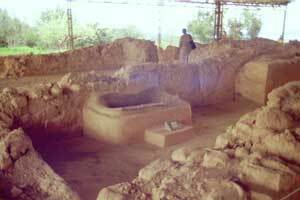 Palace bathtub of the sort Agamemnon was murdered in. 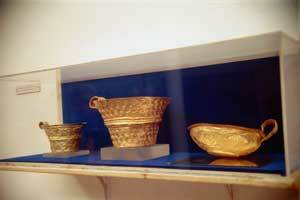 Homer calls Mycenae ‘rich in gold’ and these cups prove he was right. 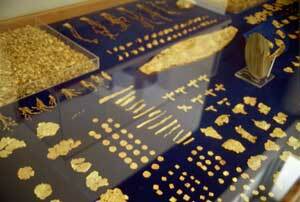 Pure gold adornments for hair, clothes, and body. 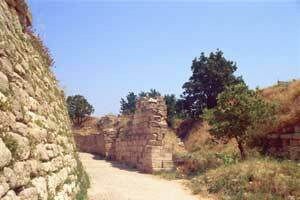 The first thing that would have struck Helen as she approached Troy were its famous formidable walls. Today they are only about a third as high as they stood in ancient times. 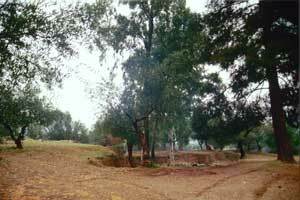 Troy was lost for many centuries and only rediscovered at the end of the 1800s. Standing before the actual surviving walls is a stirring moment. 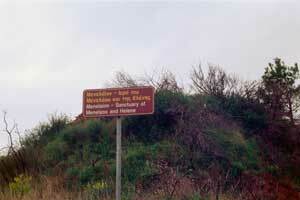 Achilles, Hector, Odysseus and Paris fought here. 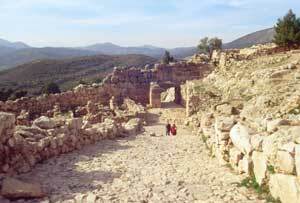 Helen, Priam, and Hecuba looked down from the tops of these walls. 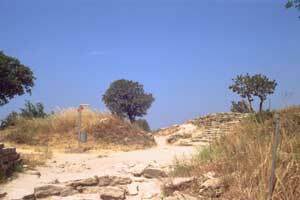 Today the east entrance is the best preserved; the famous Great Tower of Ilium, and the Scaean Gate, are gone. So complete was the destruction of Troy that even the ruins are scanty. 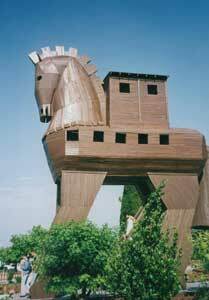 Tourists complained of there being little to see, so the Turkish Ministry of Tourism built this replica of the Trojan Horse, a popular amusement for visitors. In the desolation of the old citadel of Troy, the wind still blows through the struggling trees and the plain of Troy, where the warriors clashed, spreads out below. 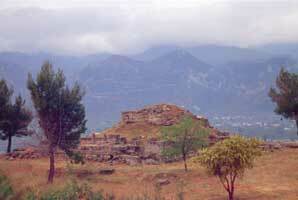 In the novel Helen returns to it and encounters the vanished city, climbing to this spot where her palace had stood.